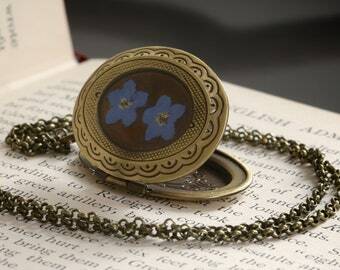 This is a locket necklace with genuine dried forget-me-not flowers. 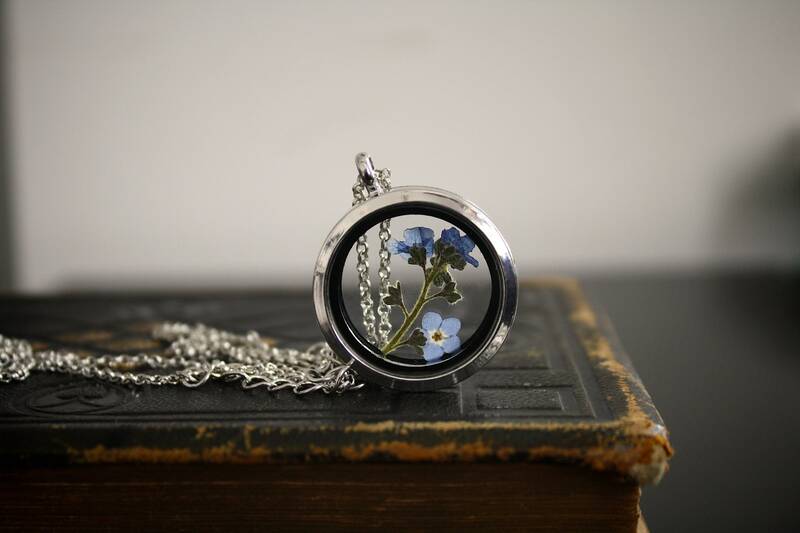 I combined one pressed flower on its stem, and one separate open flower inside the glass locket. 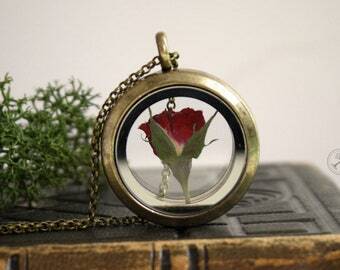 Be aware that each necklace will be unique and small varieties are to be expected due to using natural flowers. I was inspired to make this necklace by a love for nature, and the symbolic significance of forget-me-nots (as a perfect gift of remembrance). 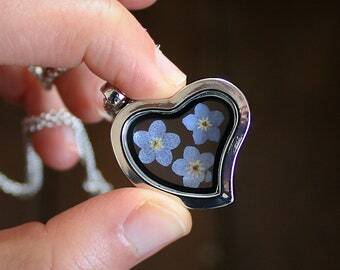 The locket can still be opened and works with a magnet closure, however be aware that the flowers are fragile! 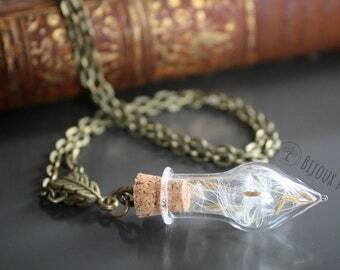 You could still add on very small items, such as dandelion seeds or other tiny flowers for example. 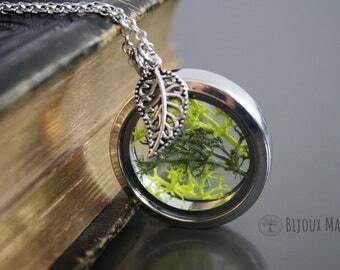 • Size pendant: 3cm, glass locket closes with magnet. • Materials: Silver tone metals, partially stainless steel and white brass (a rhodium colour silver). Glass. 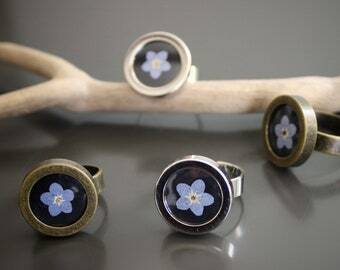 Genuine dried forget-me-nots / myosotis. 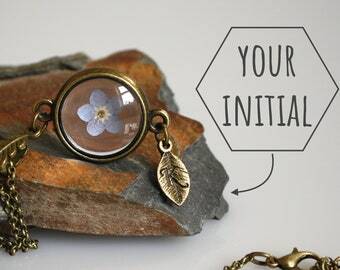 • Packaging: The necklace will be packaged in a gift box with the flower's name on the inside of the lid. The envelopes used for posting are free from plastic. Orders are dispatched from the UK in 1 working day. • ✉ Within the United Kingdom: Standard and free shipping comes with 1st class Royal Mail (average 1 to 2 working days). Prefer an even better service? Select 'Special Delivery by 1pm' (average 1 working day). • ✉ International (including USA): Standard and free shipping comes with untracked Royal Mail airmail (average delivery time between 1 and 3 weeks). Prefer a better / tracked shipping? Select 'Royal Mail Signed For' at checkout. This service will include tracking for Western Europe, USA and Canada (average delivery time between 1 and 2 weeks). International shipping times can vary widely, so these are mere estimates outside of the holiday season, or other disruptions. Please do not copy my title, pictures, text or design to portrait it as your own work or for commercial gain. Features on blogs and social media are very much appreciated, as long as the source is provided (my name, shop name and/or a link to my shop). First published: 18th of March 2018. 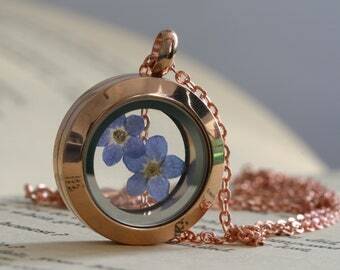 Such a precious and beautiful piece! beautiful piece - just as expected. Shipped on time as stated and well packaged. Thank you for making gift buying so easy. 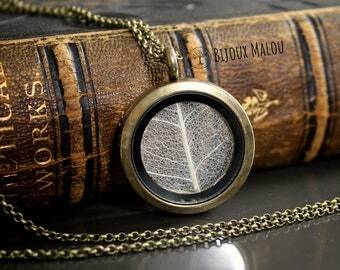 Small changes, such as the length of necklaces, can be made without any extra charges, by simply leaving a note with your order about this. If you are looking for any larger changes, feel free to get in contact through Etsy messages and I might be able to help. However, every now and then I might have to turn down custom orders, depending on how busy I am fulfilling regular orders. I run this shop alone, and therefor have to make difficult choices to manage my time. To keep your jewellery in the best condition, please store them in a dark and dry place (such as the pouch or box in which the jewellery comes). Also keep it away from harmful products (perfumes, chemicals), and only clean them with a polishing cloth, or a damp cloth, but make sure to dry them very well! My items are not made to be used in water. Regular packaging: Each item comes in an individual gift bag or in a gift box (see the individual listing information). Add on gift wrapping: Click 'this order is a gift' when the item is in your basket, and you will have the option to add on wrapping. By selecting this gift wrapping your order will come packaged in a gift box which is wrapped in a eco-friendly wrapping paper and washi/paper tape. However be aware that this means you can no longer open the package before gifting it (without damaging the packaging). Within the UK: If you are in the UK and the order is not with you within a week please get in contact and I will dispatch a new parcel. International (including USA): If your international order still hasn't arrived within 5 weeks (when shipped with regular post) please get in contact through Etsy messages and I will always dispatch a new parcel. Please understand that I will only know about a non-delivery if you get in contact with me, so don't hesitate to message me if your parcel hasn't arrived! What international shipping options are available? Standard Airmail Shipping - Cheapest delivery option going through regular local mail, without being tracked! In the shipping/policy you can find estimated delivery times. Signed For / Tracked Shipping - This shipping option also goes through local mail, but will have tracking available for the following destinations: Canada, USA and EU countries. For other countries, this service has no tracking. Signature required on arrival. Courier Express Shipping - This service is an upgraded shipping type which is fast and comes with full tracking. Depending on which country you are located in it will either come with DPD, UPS or FedEx. Phone number required! If I don't receive a phone number within 24 hours, the order will be cancelled. What happens if my order arrives damaged or broken? While I always try to package parcels very well, every now and then there might be one parcel which doesn't survive the rough handling in the post. 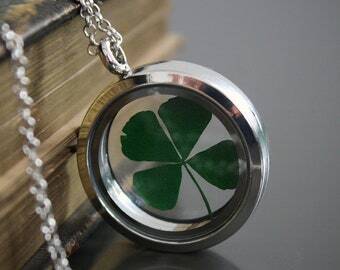 I double check everything I send out, but there can be cases where something might break within a short time when wearing it (due to a faulty clasp for example). If this is the case please always contact me, by sending an Etsy message! I will do everything I can to make up for the trouble, and you will always receive a new item. My customers mean everything to me, so when something is wrong please give me the chance to set it right. Safety hazards: proper use of products, injuries and children. All the jewellery and bookmarks I make are designed for adults, and can be a safety hazard to children. 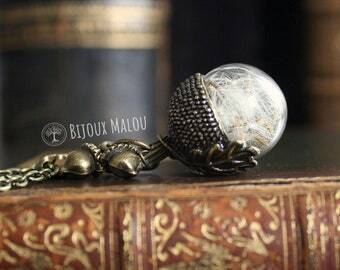 I use strong metals, glass, glue, glow in the dark, obsidian, small parts, which makes my items unsuitable for children! Neither should my jewellery and bookmarks be used for any other purposes then which they were intended for (the metal grade isn't food safe for example, nor should jewellery be worn during exercise). I am not responsible for any injuries, deaths or damages caused by any of my products. What UK shipping option are available? Standard and free shipping comes with 1st class Royal Mail (average 1 to 2 working days). I will close my shop for a few days between the 6th and 9th of May to spend some time with family.